Imagine withdrawing all of your rapidly dwindling Moldovan leis, having your last Moldovan dinner, racing to collect your baggage from storage before you are time barred, then forgetting to change your money, but whittling away seven hours with your daughter in the most idle leisurely of ways; people watching in a bus station, Chisinau. Imagine getting to Bucharest early Saturday morning after a nightlong uncomfortable bus-ride; tired, hungry and stiff. Imagine hoping for a quick taxi ride to the hotel, a scalding hot scrub in the shower and a long rest; then finding out your hotel won’t accept you in the morning, as check-in begins at 1pm and in any case ‘your room’ is currently occupied. Gah, the battle of the currencies. Imagine all that, and you’ll be confused and panicky as I was. I was a step away from being rich broke in a foreign land. Rich because Moldovan leis, broke because no one wanted them. Luckily, the taxi driver accepted the few euros I had on me, and I dolled them out to him, only to later realize that I had over-paid him! Oh well..
We finally found a forex bureau tucked in the belly of some random building, and yes, they accepted our Moldovan leis, and gingerly handed to us Romanian new leus (RON) in exchange. I was so relieved I would have kissed her forehead, but as a globetrotter, I have learnt to respect cross cultures, and not behave too crazy until I’ve established that which is acceptable or not..plus I was about to tip over due to extreme hunger and had to make a mad dash for some food. I later realized after calculations that she’d given us alot less than the correct amount. Sigh. Travel lesson 101 for dummies: Always change currency before entry into a country. It’s safer that way, and you avoid getting scammed by money-changers. Our first meal was a juicy hot dog and refreshing lemonade, at a stand right next to Unirea shopping mall; the total cost, seven Romanian leis (1.55 euros). I knew that we would frequent the stand for breakfast throughout our stay. Because cheap..healthy and tasty. 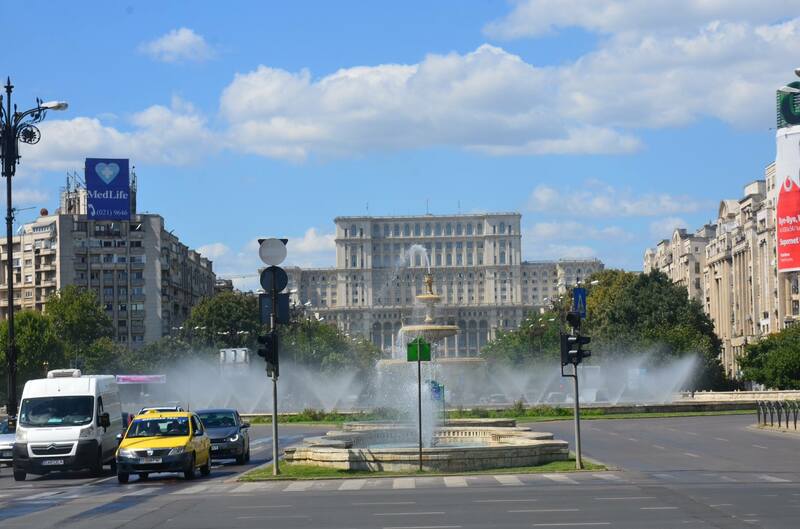 We enjoyed our breakfast then spotted the Bucharest Free Walking Tours guy with a loud orange tee plus a small crowd around the fountain at Unirii Park around the fountain, so we skipped across the road to join them, for a crash course of the city. How is Bucharest? You may ask. 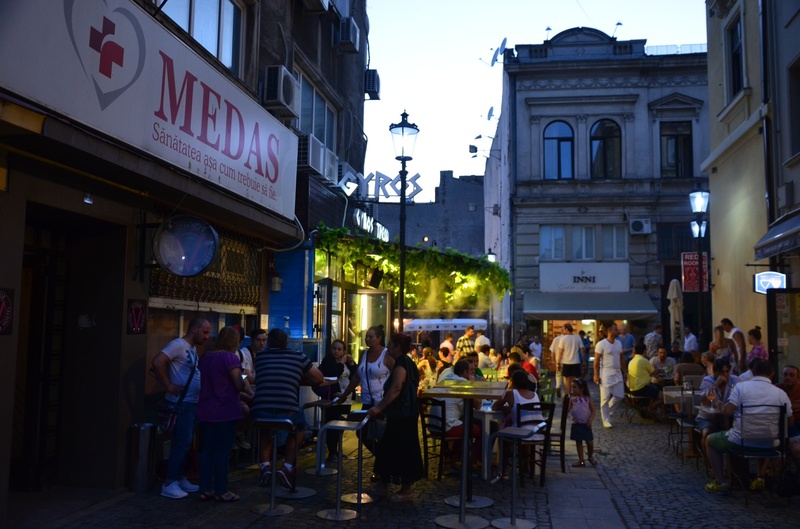 Believe it or not..Bucharest has that charm that pulls you in. Every stereotype you’ve heard about Romania’s capital overflowing with stray dogs and gypsies? Scratch that. With it’s somewhat French-inspired architecture, boulevards, malls and even an arc de Triomphe; small wonder Bucharest is referred to as ‘Micul Paris‘ or the Little Paris of the East. The city easily makes you feel at home and comfortable; with friendly and helpful locals, and English is widely spoken here. Your travel snobbery will be appeased in this city. CEC Palace, the headquarters of CEC Bank. Bucharest can be noisy. If your hotel is smack dab in the middle of the city as ours was, it is less time-consuming walking from the little epicenter to the rest of Bucharest..the Unirii park is a stroll away, leading us to fountains, the mall and boulevards..BUT..it gets pretty LOUD at night. How we slept through the sound of clanging plates and Sia blaring cheap thrills every night, beats me. Bucharest is teeming with history. Walking through the city will have you exposed to different historical eras, in quick glances. Perhaps the most notable landmarks may be found around Revolution square; the equestrian statue of Carol 1 and the monument to the victims of the anti-communist revolution. 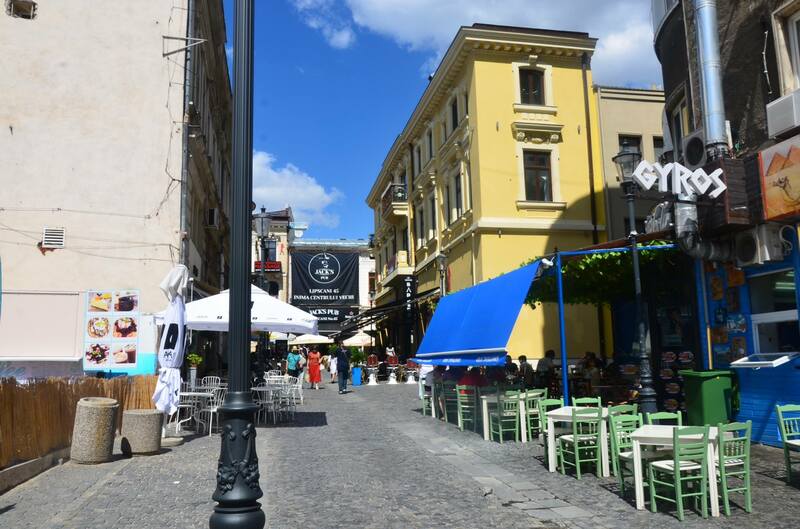 In other parts of the city center, you’ll see the bust of Vlad the Impaler (Vlad Tepes), the statue of the wolf nurturing Romulus and Remus, and a curious statue representing the birth of the Romanian nation outside Bucharest’s National History Museum. Then there’s the Palace of the Parliament; a palatial spread, the world’s second building after the Pentagon and former dictator Nicolae Ceasescu’s most infamous creation. Bucharest is a bibliophile’s dream. You’ll likely bump into books everywhere; street bookshops out in the open air, as well as at various points around the city and then there is the 19th century monument turned bookstore, the Carousel of Light an attraction in it’s own right. It is new, having opened in February 2015, with six floors and holds an excess of 10,000 books. Not only that, but there is a bistro on the premises, definitely a must visit in Bucharest for anyone who loves to disappear between the pages of a book. Bucharest has chutzpah. She is a city that dares to, that is audaciously different. Where else can you find buildings in a state of disrepair receiving a jolt to life in the form of street art or graffiti; or find a burgeoning night life and a good slew of al-fresco restaurants? Bucharest is green. Bucharest is cool enough to make room for a couple green lungs in the mix of all this. There’s Herastrau park with it’s bicycle lanes, ducks, swans and a little lake with boats. A great place for relaxation and there are a few statues to remind us of it’s history. There’s also Izvor park next to the Palace of Parliament. All the parks can be easily reached by public transportation. Bucharest is the bomb..You’ve got to hand it to this city. Have you been? 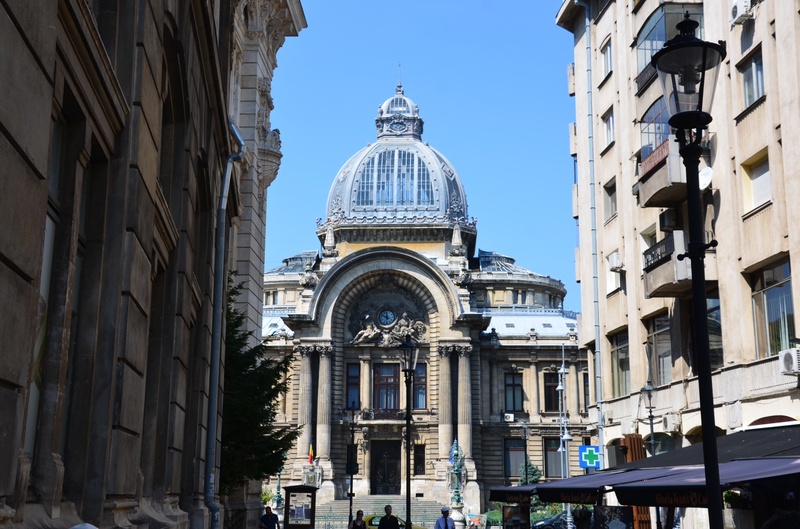 Would you consider visiting Bucharest? Next point in our #BackpackingEasternEurope tour was Brasov in Transylvania. I always change some money before I leave but generally I get much better rates when in a country of destination. Compare: 1 euro to 25 Ukrainian hryvna in my country to 1 euro to 28 Ukrainian hryvna in Lviv, no commission fee. Wow Ele..that’s quite a good change. I thought, that I would get my money easily changed in Bucharest without any big deal..I came from Odessa to Moldova, and they changed my money in Moldova without a hitch..but it was scary not being able to find a place to change my money in Bucharest…and when I got it changed, I lost a lot in the transfer, don’t know if it was commission. When we had our Litas and went to Poland, they won’t take it in some of exchange places but their Zloty was universally taken in ours. Talking about neighbours. Oh my! That’s an interesting observation. Can be very surprising for someone visiting. I’ve decided you can’t win with money changes. You get screwed on entry and on departure. I usually get the currency from the ATM and try to spend everything whilst there. I do end up with some here and there still though. Bucharest is exactly as l pictured it. A lot of B movies which l love are filmed there. Glad you like it. IIt’s so nice to see you liked your stay in Bucharest. Currency can be an issue if you don’t have euros or US dollars. Usually you can exchange most currencies at a bank, but it’s a pain having to wait in line for a long time. I also learned it’s important to exchange money before leaving the country as I had some trouble when travelling. Yes Luminita, I really appreciated Bucharest. Lesson learnt about the currency change..it was a panicky situation for me at the time. ‘Love your post. I wanna go to Bucharest toooooooo! ‘Glad you liked italthough have not been to the Balkan states yet! Re-currency change, like KemKem, I tend to use the ATM machine and forego moneychanging altogether lol! However, I always make sure NOT to spend it all, as I like the incentive that I can always come back. And in many cases, I do, and then I have some pocket money to get a taxi or buy a cup of tea or something lol! 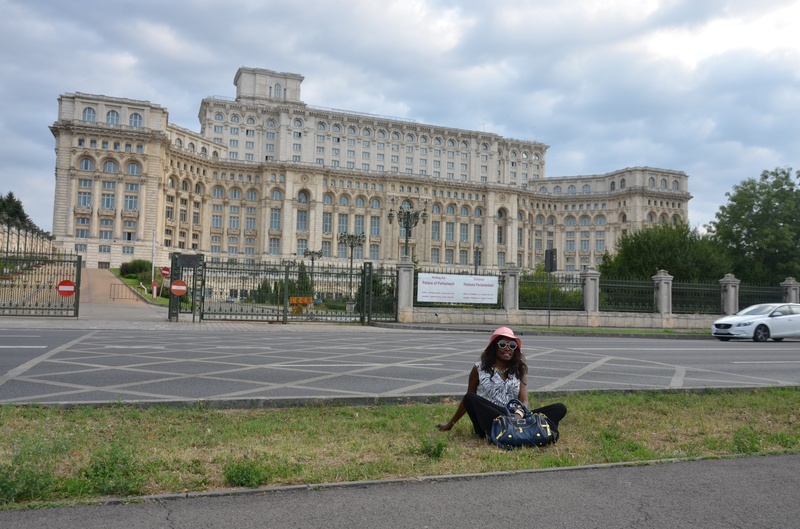 Bucharest was a pleasant surprise! You have to visit the Balkans Victoria..amazingly friendly folk especially in Bosnia and Herzegovina, Romania etc.. I tend to like some cash on hand incase I have problems with the ATM, but I agree that’s likely the best course of action. We spent some spare cash for a breaky of lemonade and doughnuts at Timisoara airport waiting for our flight to Brussels; but needless to say, when we reached home we had currency from all the countries in our bags, most notably the Ukrainian hygrivna..we’ve kept the coins and notes in jars until we decide what to do with them..:-) we loved Kiev, so that will be handy!